I went searching for some background on Yemen today and found this interesting article in the Washington Post the day before the Xmas bombing attempt which will now be used to justify further war plans in Yemen. Funny how the Major Media has forgotten about this background. When foreigners set out to kill Americans I find it highly relevant that the U.S. gov't has been killing them first. What goes around, comes around. Information about any spike in U.S. involvement - including an airstrike last week, which missed a key al-Qaida leader but killed other militants and, reportedly, some civilians - is closely guarded by Yemeni authorities, who fear that a visible American role in the country will fuel internal conflicts. As a result, observers can only whisper about Americans coming and going at an increasing rate from a military base in northwest Yemen, or the sightings of new aircraft and drones in the skies above. I worked with another aircraft at all times in what is called a hunter-killer team. I was told by the other pilots in the unit how to tell a VC from a civilian--if they were running, they were VC. If they were standing there, they were well-disciplined VC, shoot 'em anyhow. If they're alive they're VCS [ viet cong suspects] automaticly. If they're dead, they're confirmed VC . In November of'68, in an area called the Wagon Wheel which is northwest of Saigon, while on a routine search and destroy mission, gunships which were providing security and cover for us in case we had any contact were circling overhead. Well, no contact was made, and the gunships got bored. So they made a gun run on a hootch, with miniguns and rockets. When they left the area, we found one dead baby, which was a young child, very young, in its mother's arms, and we found, we found a baby girl about three years old, that were dead. Because these people were bored; and they were just sick of flying around doing nothing. Then when it was reported to the battalion, the only reprimand was to put the two bodies on the body count board and just add them up with the rest of the dead people. - Mark Lenix, American veteran testifying at the Winter Soldier hearings on the Vietnam War. In the Vietnam War the U.S. gov't killed a lot of children, even babies, and then marked them as VC on the body count board, so how many of the "al-Qaida militants" we've killed in Yemen last month were under ther age of five? 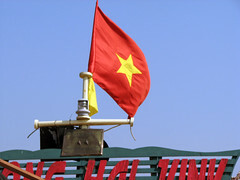 [FYI the term "Viet Cong" was a label created by an American psyops officer in 1958 and sold to the Media because most Vietnameses saw the Viet Minh as patriots, the Vietnamese communists never used the label "Viet Cong", that was an American creation. The correct answers is at least 23 Yemeni children killed by U.S. just before Christmas. See comments and links below.